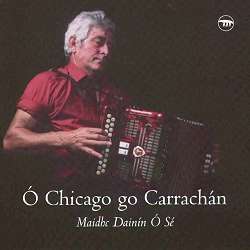 This album features Maidhc Dainín Ó Sé (vocals, button accordion - and possibly penny-whistle). On several tracks, he is accompanied by Caoimhín Ó Sé (flute, and possibly penny-whistle), Fergus Flaherty (guitar), and John Browne (banjo). On Track 4, there are guest appearances by Johnny Connelly (melodeon), Nóirín Ní Gráhdaigh (fiddle), Aisling Ní Neachtain (harp) and Caoimhín Ó Sé (flute). Daítha O Sé (vocal) also performs on Track 6. The following items are included. * Although the tunes on this track are all listed as polkas, the first is clearly a slow air. Maidhc Dainín Ó Sé is a man of many talents, and this CD (his first) gives listeners a fair sample of them. The accompanying booklet describes him as "musician, vocalist, poet, writer, lecturer, seanchaí, comedian and more besides." (seanchai - also sennachie, shannachie, etc. - "One professionally occupied with the study and transmission of traditional history, genealogy and legend; now chiefly ... a Gaelic teller of legendary romances." OED) The recording presents a collection of slides, hornpipes, jigs, reels and polkas, together with several songs and a recitation in the Irish language. The tunes speak for themselves, but unfortunately, there's no translation of the texts for the benefit of ignorant listeners who don't know Irish. The introductory notes are also in Irish, with only a brief English summary of their content. The roll-call of supporting artists doesn't always specify which instruments they played - despite my best efforts, I couldn't discover who played the penny-whistle on track 11. So much for the packaging - now for the music. I found this a pleasant, though not particularly exciting record. The slides on Track 1, the reel on Track 7, and the hornpipes on Track 12, are all played with precision and sensitivity; but they're delivered in a rather staid manner, more appropriate for the drawing-room than the dance-floor. This isn't simply a matter of tempo - playing faster doesn't automatically generate more excitement. The guest performers on track 4 prove the point by taking their reels at an easy pace, but still giving them a very engaging lilt. On the other hand, the polkas on Track 10 go at such a gallop that the accordionist sometimes has difficulty in articulating his notes clearly, and the contours of the tunes become blurred as the pace hots up - though the banjo player deserves credit for never fluffing a trill. In contrast, the whistle-player on Track 11 shows how to drive a tune along without flogging it into the ground. The melody is given room to breathe, while the decorations enhance its flavour, rather than merely showing off the performer's dexterity. This track, and a few others, never failed to grab my attention, and raise my spirits, every time I played the record. But after the second or third hearing, I found myself automatically reaching for the 'skip' button at certain points in the programme. Dr Samuel Johnson said of the Giant's Causeway that it was worth seeing, but not worth going to see. I confess, with some regret, that I have similar feelings about this record.